DBHawk enables users to develop, browse, and administer multiple databases online. It allows database users to connect Oracle, MySQL, SQL Server, Amazon RDS, Heroku and other databases through a web browser. 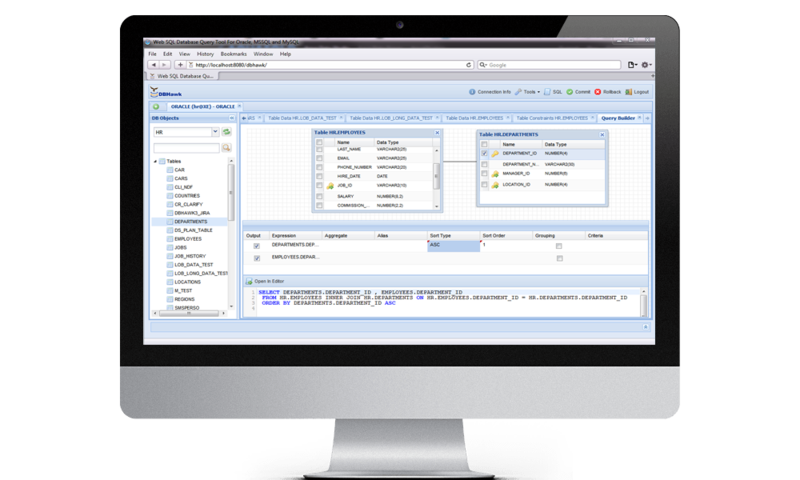 Users can browse, manage, and develop database objects such as Tables, Views, Sequences, DB Links, Synonyms, Functions, Procedures, Packages, Triggers, Types etc online. Using DBHawk user can create Tables, View, Sequences etc. User can alter Columns, Tables. Add new indexes to the tables, add or create Primary Key, Foreign Key, Unique Key, Check constraints. Using DBHawk, DBAs can manage databases, Manage Users, Security, Sessions, Storage Etc. Using DBHawk advanced SQL Query Editor user can execute multiple queries and view results into separate tabs. User can format queries, Cancel Long running queries, View Query History, Create Database Reports in PDF or Excel format, Export results into various formats, Save SQL Queries or upload queries. User can also apply various functions on result sets to do further analysis. DBHawk provides advanced auditing capability. It logs all users connections SQL queries into log files for database auditing purpose. Admin can view – who accessed what. 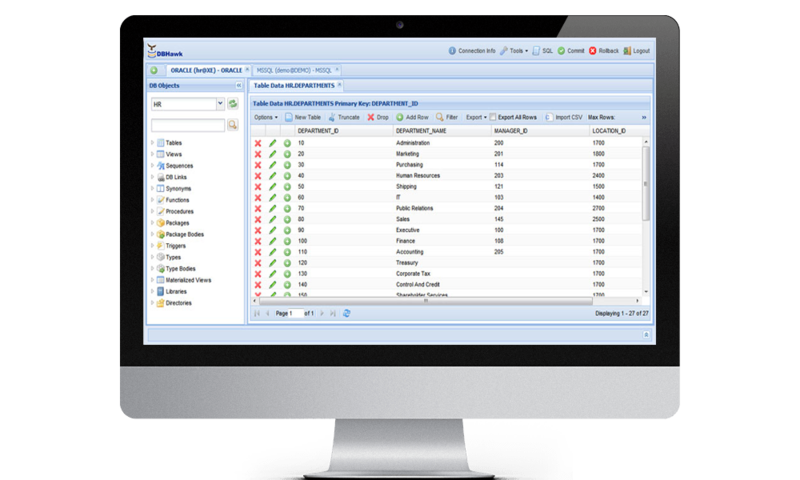 DBHawk provides advanced capability to manage table data. User can create new row, delete row, duplicate row or edit existing row. Using DBHawk – database user can easily manage data in a clob, blob or other formats. It also provides single row view of table data. DBHawk visual SQL Query Builder makes building SQL queries easy. Using database report designer user can create database report into PDF or excel format. Using DBHawk jobs – user can schedule reports and receive automatic reports results by email.